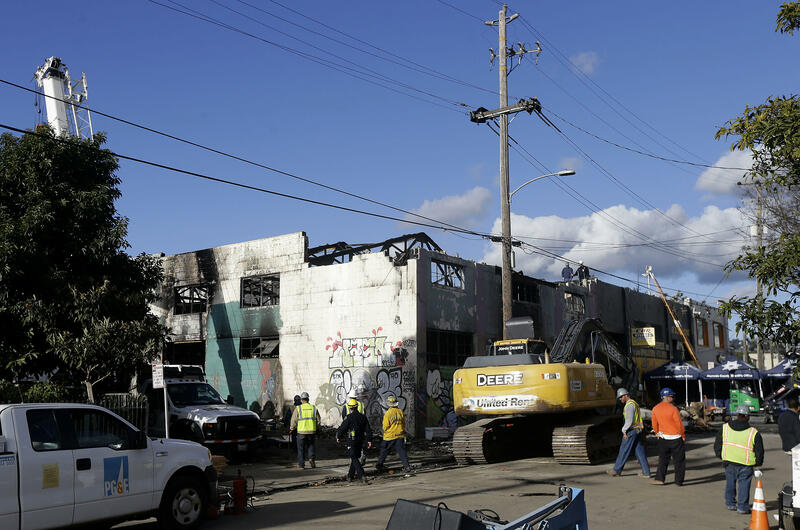 OAKLAND, Calif. - The fire that killed 36 people during a dance party at an Oakland warehouse grew rapidly and was raging by the time people on the second floor of the building detected it, trapping them upstairs, investigators said. She said smoke traveled up two stairwells, trapping the occupants on the second floor. Federal investigators provided the details Wednesday. With the death toll at 36, officials earlier announced that recovery efforts at the site have ended. The news comes a day after Oakland officials declared a local state of emergency due to the fire. The Oakland City Council is slated to ratify the state of emergency on Thursday. This will begin the process for state and federal aid. “We have no indication that this was intentionally set,” she said. According to one document, inspectors came just two weeks before the fire but were unable to gain access. Video obtained by CBS News shows police officers inside the structure, purportedly less than two months ago. Officials have begun releasing victims’ identities, and all but one of the 36 have been identified so far. “Everything that I did was to make this a stronger and more beautiful community and to bring people together,” Almena told NBC. The fire broke out during a dance party Friday night in the cluttered warehouse. It had been converted to artists’ studios and illegal living spaces, and former denizens said it was a death trap of piled wood, furniture, snaking electrical cords and only two exits. Almena did not respond to emails or calls to phone numbers associated with him by The Associated Press. He told San Jose television station KNTV that he didn’t attend the event Friday night and that he and his wife had decided to stay at a hotel because he was exhausted. City and state officials fielded years of complaints about dangerous conditions, drugs, neglected children, trash, thefts and squabbles at the warehouse, raising questions about why it wasn’t shut down. The district attorney warned of possible murder charges as she determines whether there were any crimes linked to the blaze. A building inspector who went to an Oakland warehouse on Nov. 17 after receiving a complaint of illegal interior construction left after being unable to get inside. Oakland Mayor Libby Schaaf said late Tuesday the inspector followed procedure and later sent a request to the owner to gain entry. She did not reveal the outcome of that request. Under the Oakland city code, building officials and fire marshals need court permission to enter commercial lodgings if the owner or manager refuses access. Building inspectors typically cannot force entry to a property unless there are pressing circumstances, Schaaf said. Fire officials have started knocking down parts of the building, known as the “Ghost Ship,” that they said were structurally unsound. Alameda County sheriff’s Sgt. J.D. Nelson said that of the 36 victims found, 35 have been identified and 20 of their families have been notified. Officials are still lacking any type of identity for one person. Stories of the victims’ last minutes, meanwhile, emerged.